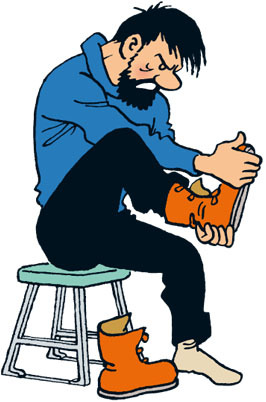 Captain Haddock is the most popular character in the Tintin family. Haddock has always been a bit naïve and is a man of moods, good and bad, and this is part of his charm. Haddock is his surname, and his first name, Archibald, is only revealed in the penultimate adventure, Tintin and the Picaros. The haddock is a sea-fish which is popular on both sides of the North Atlantic, and should not be confused with the names, Drydock, Paddock, Padlock or Harrock, some of the names which Haddock is called by Bianca. He first appears on page 4 of the specially created weekly supplement, Le Soir Jeunesse, on January 9, 1941. We are always keen to learn the age of a character but Haddock's character is of course fictitious and his creator remains silent about his age. Captain Haddock was a seafaring captain and is the archetypal sailor, depicted with a hot temper and capable of infuriating actions. He sailed for over twenty years. In the later adventures Haddock who has clearly retired, lives in Marlinspike Hall, his ancestral home. Haddock is an officer and a gentleman. Haddock is by nature emotional and irascible, the very opposite of Tintin who is sober & sensible, but he has a heart of gold. Just like Tintin, he is always willing to help people in trouble. A composite mix of roughness and tenderness, he is shown as quick-tempered. Haddock alludes to his mother, during his first meeting with Tintin. As for his family, we know that he is the descendant of the knight François de Hadoque, a navy captain who served under Louis XIV. The king of France entrusted François de Hadoque with the command of the frigate "The Unicorn" which the latter lost under circumstances which were revealed in The Secret of the Unicorn. His appearance is that of the archetypal sailor. Most of the time, he wears a sailor's outfit comprising of black trousers, sailor's hat, blue pullover with an anchor on it, and we often see him with a pipe in his mouth. Captain Haddock has a wonderful repertoire of expletives. These words are not insults, but when used with a certain vehemence, sound like awful insults. At the beginning he is not heroic at all, but in the later adventures Haddock becomes genuinely heroic and would not hesitate to sacrifice his own life to save his best friend Tintin, as in Tintin in Tibet. Haddock is courageous but he is also very clumsy, not unlike the Thom(p)sons. We know that he sailed for over twenty years with his friend Captain Chester, who has red hair and a bushy moustache. They have a unique ritual when greeting each other. Two reporters working for the magazine Paris-Flash take pictures of Bianca Castafiore and Captain Haddock and write an article for the magazine claiming that Bianca Castafiore and Captain Haddock are engaged, much to the latter's anger. However, our Captain is more interested in trying to stop drinking than falling in love with the Diva. Blistering Barnacles ! He's awesome, especially his collection of swear words! I always liked haddock. I believe he is one of my favorite characters of the whole series. BLUE BLISTERING BARNACLES IN A THUNDERING TYPHOON!! !